(01-23-2019, 05:35 AM)Ballaratcastle Wrote: Hi team. Dig a bit deeper on this site. There was a discussion just a few weeks back with responses showing measurements from front edge of door to first screw, top edge down to the base mount position etc. I don't recall the site members or thread title but someone else possibly does. 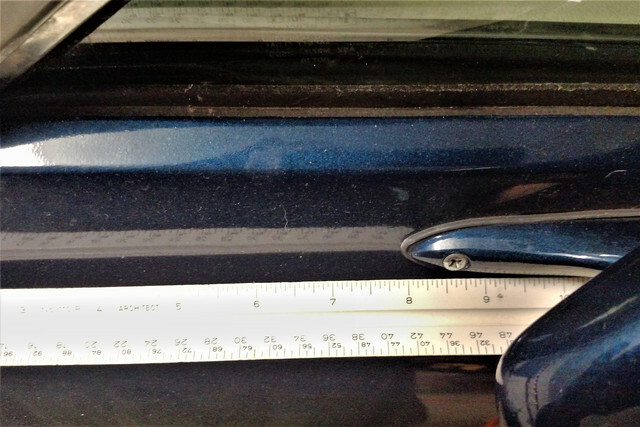 here is the measurement I Have for a sport mirror mounted to my 73. it appears to be about 8 5/8 on a level plain from the leading edge of the door. Hope this helps. Here is a pic that was deleted from my post, sorry about the poor quality. The first screw locates 7 3/4" from edge of door and 1" down from the top of door. These are from my 71 Mach 1, but as you're putting sport mirrors on to replace the chrome ones, might I suggest that you place then where YOU want them. What I mean is this, for me being shorter, I find the factory location too far back meaning I have to lean my head back a bit just to see into the drivers mirror. If I were doing a resto-mod or just not bothered by correctness, I'd locate the mirrors forward by a couple of inches. These cars must have been designed by the Jolly Green Giant...…….. or at least a good 6 footer. Then I would (and as I did), replace the passenger side mirror with a convex glass. These can be bought from OMS amongst other vendors, but are only the same size as the original. I made an option to this that imo works far better. See pic.